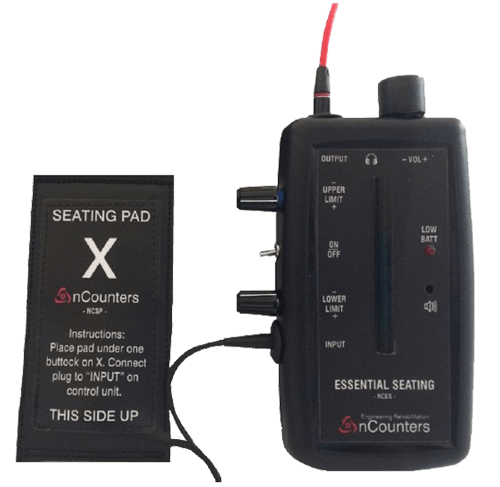 The nCounters Essential Seating Angle Sensor gives Immediate audio and visual biofeedback on seating posture and seated weight shift. Immediate audio and visual biofeedback encourages your patient to maintain a balanced seating position. The nCounters Essential Seating Feedback Unit gives immediate audio and visual feedback on seating posture and seated weight shift for patients with an acquired brain injury. It is portable, easy to set up, simple and efficient to use daily during rehabilitation. The seating pad can be used on ANY chair. Ensure the patient is in a comfortable upright sitting position with their arms and back well supported and their weight spread evenly across the body. The Seating Pad “X” is then placed under either buttock and connected by a cable to a simple Control Unit. By turning the dials at the side of Control Unit the therapist establishes the upper and lower limit values of the seated weight shift wanting to be achieved or worked within by the patient. 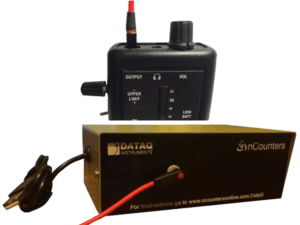 DATAQ hardware and software will accept and record data from the nCounters Essential Seating Feedback Unit. When the patient’s weight moves off the Seating Pad the patient will receive audio feedback via a speaker or headphone. If the patient is seated correctly, there is no feedback. Real time feedback is also provided by 10 coloured LEDs. When placed under the heel of the hand, the Seating Pad will give feedback on weight bearing through the arm. The Seating Pad can also be used in providing feedback on reaching tasks for the patient. nd software have been pre-configured to accept, record and save data from the nCounters Essential Angle Sensor.